During 2016 Olympic and Paralympic games, half a million people visited Rio de Janeiro. 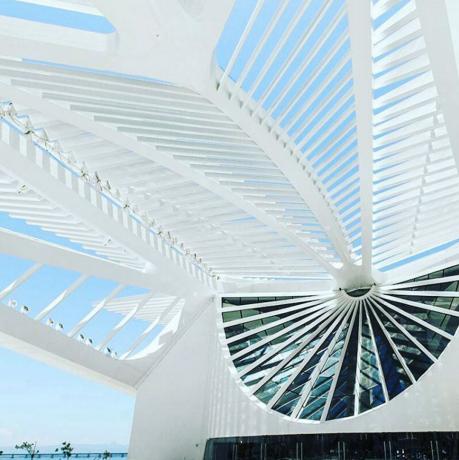 High up on all must-see lists was The Museum of Tomorrow (Museu do Amanhã) – a science museum designed by Spanish architect Santiago Calatrava in 2015. In the futuristic building situated next to the waterfront, you can examine our past, present and explore the future scenarios for the next 50 years from a perspective of sustainability and conviviality. 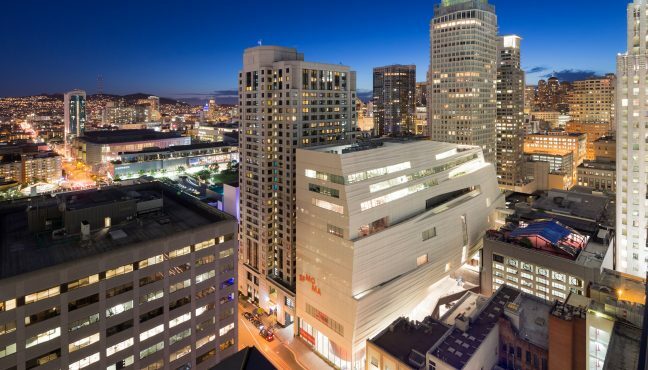 The museum mixes cutting-edge architecture and science to grab your attention and make you think of climate change and ways to solve it. 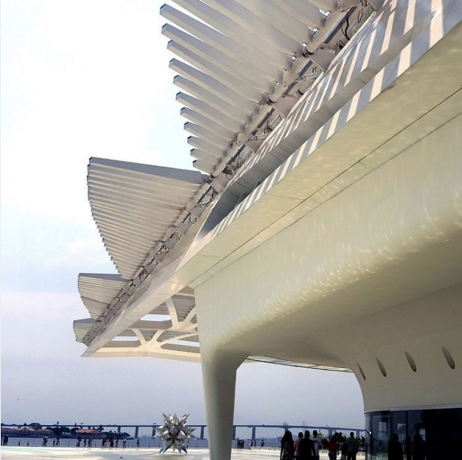 We talked to Alexandre Fernandes – Museu do Amanhã Audience Development Director and Santiago Calatrava' Study of Architecture Team about the architecture of the museum, its history and so much more. 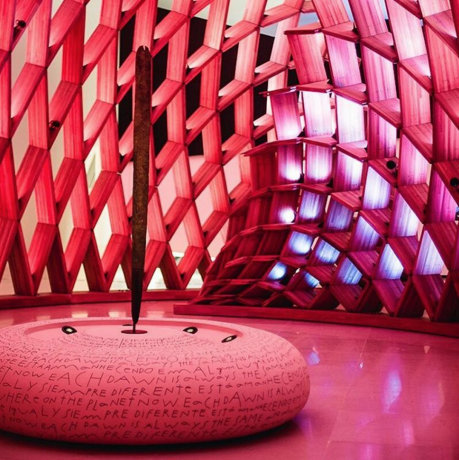 The name “Museum of Tomorrow” might seem poly-semantic. 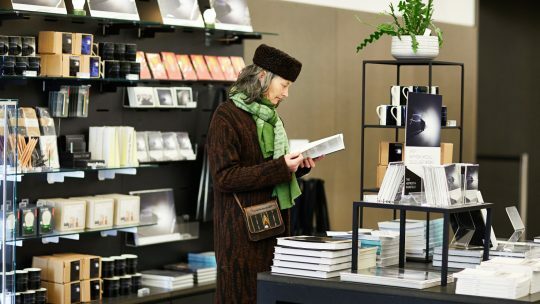 What key issues is the museum centered on? 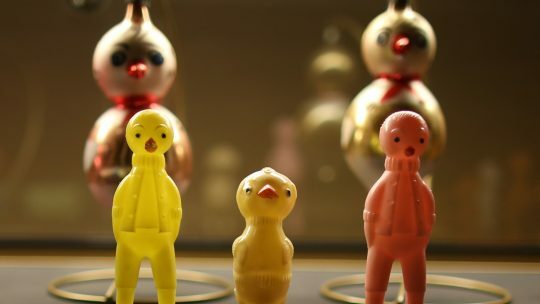 Alexandre Fernandes: The museum asks age-old questions - Where do we come from? Who are we? Where are we? Where are we going? How do we want to live? Rooted in the notion that tomorrow is neither a date on the calendar, nor an inescapable destiny. Museum of Tomorrow is built, starting today, right now. The choices we make today lead to a range of possible “tomorrows”. Our main exhibition, designed by Ralph Appelbaum and with artistic direction by Andres Clerici, is structured into five narratives: Cosmos, Earth, Anthropocene, Tomorrow and Us. It is a science and technology museum opened in December 2015 and it is as modern as they come. The entire collection is digital, built around real-time scientific data collected from partner institutions around the world, communicated through multimedia, installations and games. 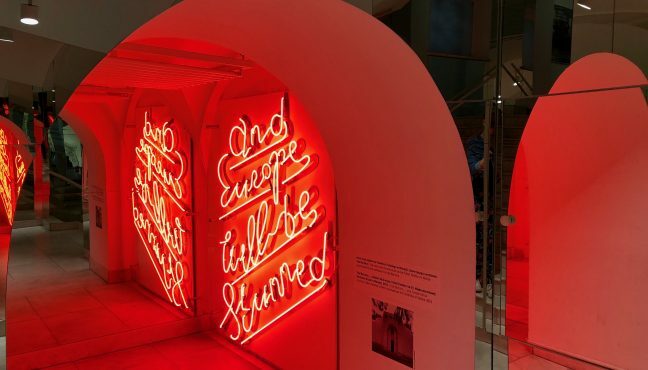 Visitors are encouraged to reflect on the Anthropocene era - the geologic era in which we live, when man began to alter the climate, degrade biomes and interfere with ecosystems – and on their own role as part of human action and its transforming power. Our aim is to probe the possible future scenarios of the next five decades by considering past and current trends. We’re not a traditional museum that preserves a collection. We have an immaterial collection communicated through experiential exhibits. The idea is that through the sequence of concepts and experiences, the visitor becomes aware of the choices we all have in our hands today that will decide which future we will have. The Museum’s architecture is striking, attractive, and the issues that the museum explores – climate change, population growth, biodiversity, etc. – are crucial and need to attract everyone’s attention to be resolved. Do they reverberate in the architecture? 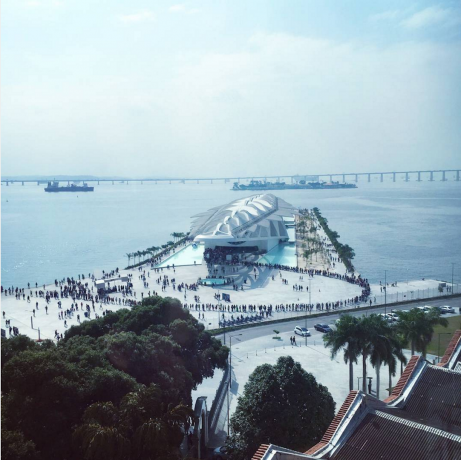 The museum is one of the anchors of Rio de Janeiro’s harbor zone refresh initiative, so called the Porto Maravilha Project. It features sustainable architecture and meets the Green Building Council’s (USGBC) standards for LEED (Leadership in Energy and Environmental Design) certification. 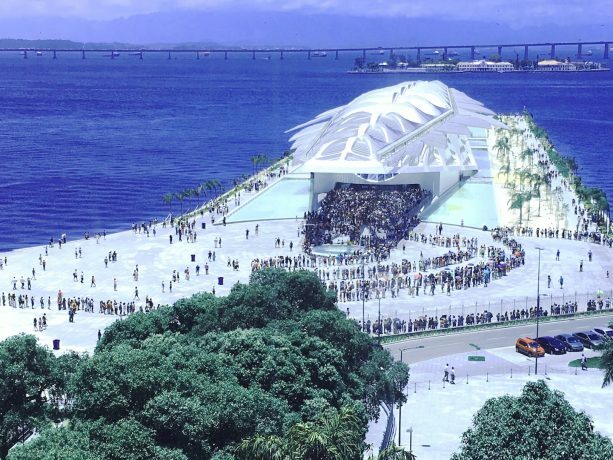 In keeping with the sustainability guidelines, which stipulate use of local natural resources, water from the Guanabara Bay are using in the museum’s air conditioning system and then, in a symbolic gesture, it is being returned to the bay. The water from the bay also supplies the reflecting pools around the museum. The air conditioning systems, irrigation of gardens and cleaning the floor do not depend on drinking water. The water from sinks, showers and air-conditioning system is held in a treatment plant, where also goes rainwater, harvested by a rail system. This care started long before, during the construction of the building. The wheels of trucks, for example, were washed with water reuse, and so did not bring dirt to the city streets. Large, steel pieces on the roof hold solar panels that shift to follow the sun’s movement throughout the day. The museum has a smart cover of 24 sets of modules of movable wings, installed in the metal roof and adding 5,492 plates of photovoltaic panels, move according to the path of the sun with the capture of energy enhanced this way, the system is able to supply up to 9% of the energy consumption of the building. 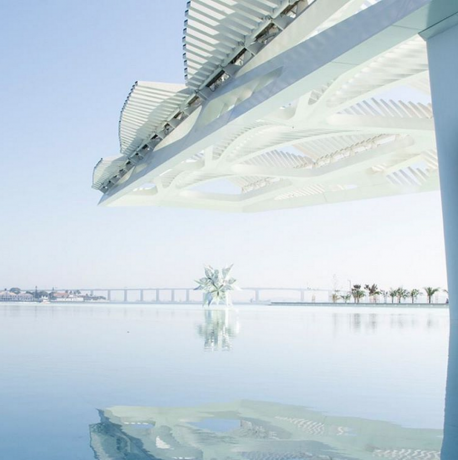 The greenspace, with landscaping by the Burle Marx studio, covers over 5,000 square meters of greenspace and features native species and plants from the coastal region where the city is located. How was the architectural project chosen? 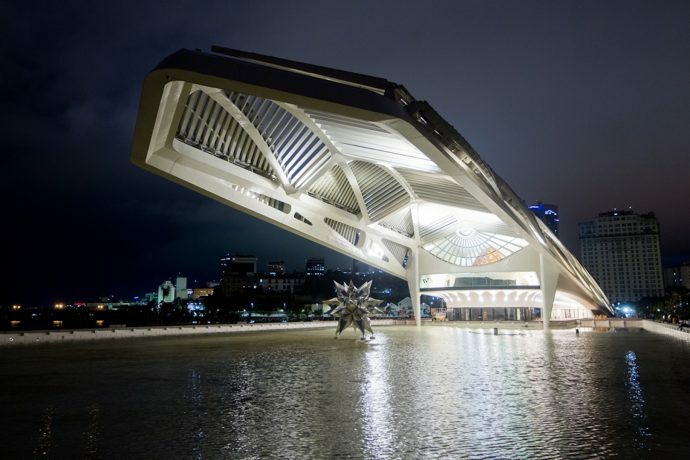 It was a personal choice of the mayor of Rio de Janeiro, Mr. Eduardo Paes, who mentioned that Mr. Calatrava was selected because of the impact that his work has and because he is a disciple of the late Brazilian architect Oscar Niemeyer. The proposal was to develop a museum that would have wide-reaching effects within its location. We wanted an architectural icon to help lead the process of renewal in the harbor area. 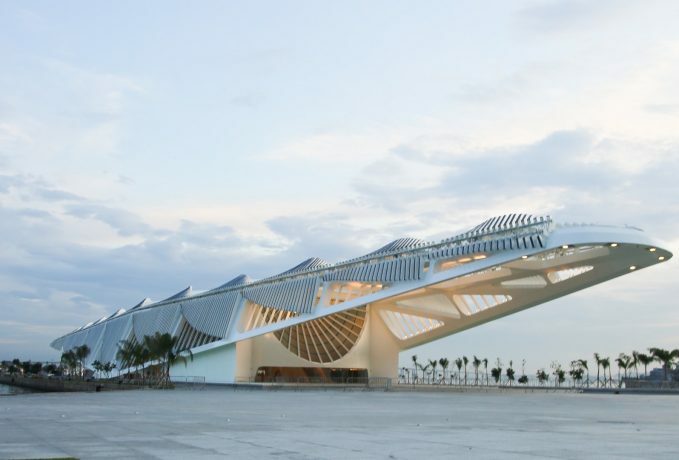 Santiago Calatrava was commissioned to create an entirely new and original building specifically for Praça Mauá. 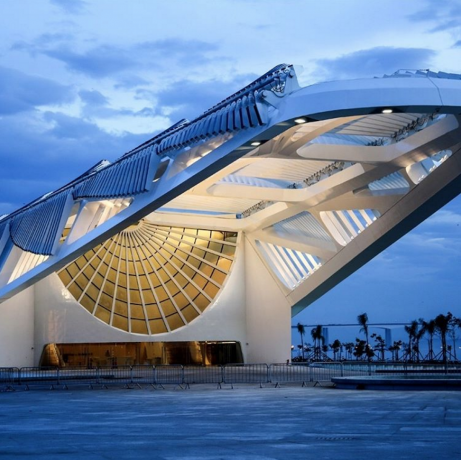 Museum of Tomorrow is an initiative of the City of Rio de Janeiro in conjunction with the Roberto Marinho Foundation (part of the Globo Group), with Banco Santander as master sponsor. 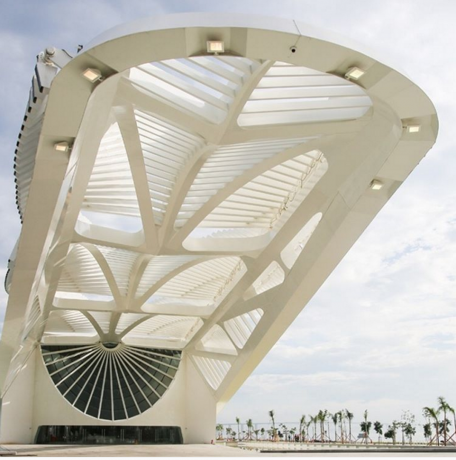 It has Shell as maintainer and the support of the State of Rio de Janeiro, through the Secretary of the Environment, and the Federal Government, through the Fund for Studies and Projects (Finep). 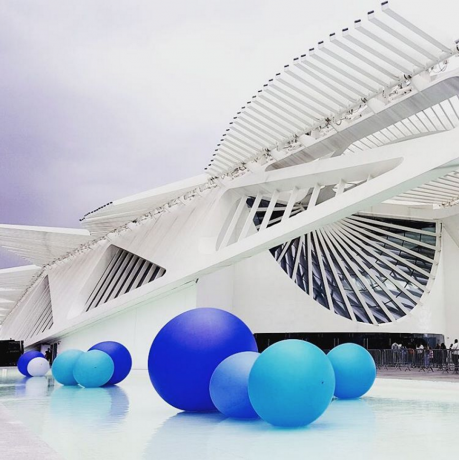 Museeum got a chance to ask Santiago Calatrava' Study of Architecture Team a few questions. What was the concept behind the Museum of Tomorrow? 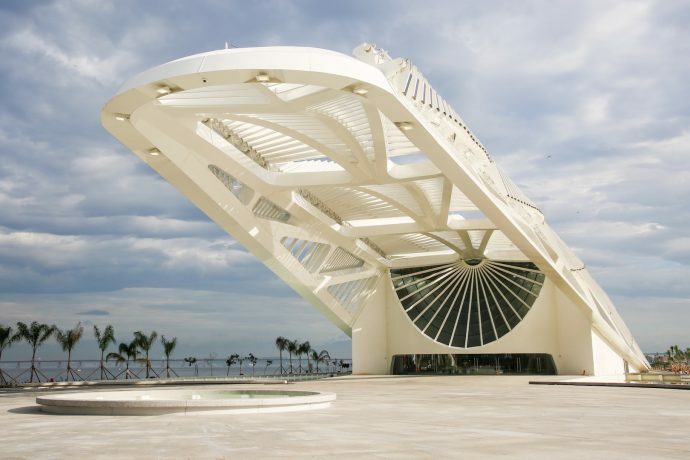 It is important to note that the concept of the museum is conditioned by its situation, which stipulates important conditions, such as an 18-meter height limit to protect the views from the bay to the Sao Bento monastery, UNESCO Cultural World Heritage, or the longitudinal size of the dock where it is located. The project uses the Bay water for a decorative element in the ponds reflecting the building, creating a beautiful visual effect, and also for cooling the building. Water passes through several filters placed successively and returns clean to the Bay by a waterfall located at the northern end of the gardens, contributing in an artistic and functional way to a cleaner Bay. 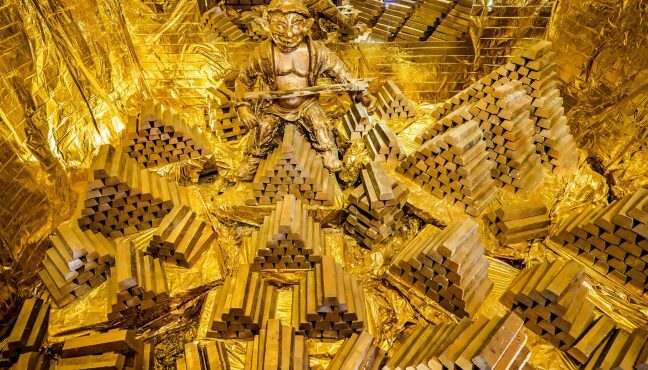 What was the inspiration for this museum? 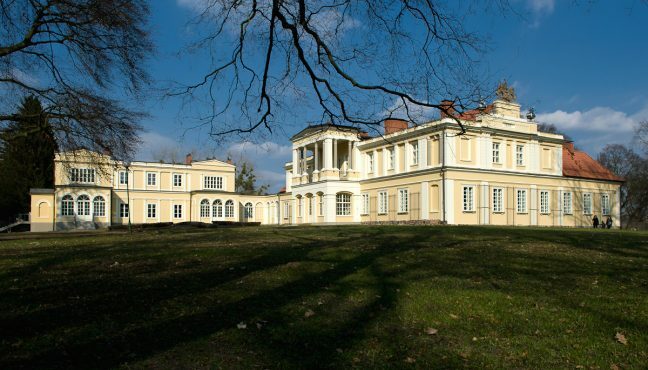 One important element for this Museum was the need to provide the project with a wide access. In this sense, we proposed the creation of a public square in front of the Museum and the demolition of the elevated highway that was well received by the authorities. 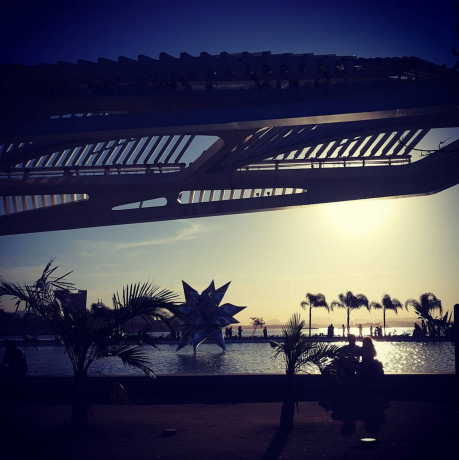 Thus, the building was opened to the city and all the area was revitalized because of the connection between “Avenida entre dos Mares” and Pier Maua, which is a natural extension from the avenue. 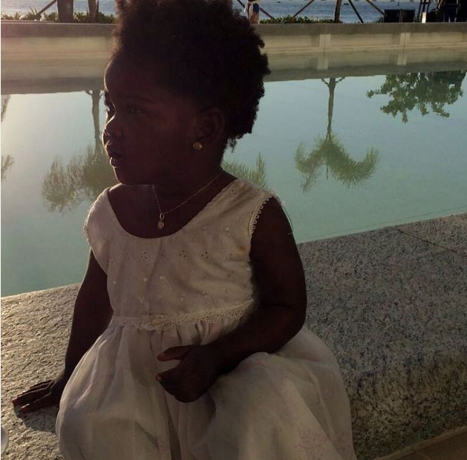 All this was possible thanks to the understanding of the “Roberto Marinho Foundation” and its partners. Furthermore, all of them helped understand the historical-cultural context of the city of Rio and its natural environment. 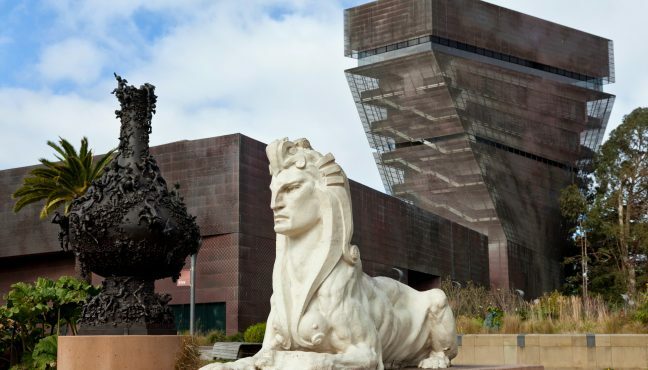 Since the museum is dedicated to sustainability, climate change and other profound issues. How «green» is the Museum of Tomorrow building? The Museum’s perimeter is surrounded by different ‘green’ pedagogical elements. 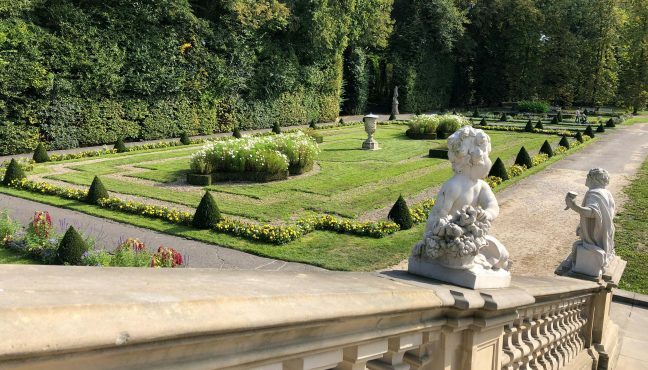 Everybody can enjoy walking around the new gardens, designed by well-known Burlé Marx Studio. These gardens include native botanic species from the ‘Atlantic Forest’. This biotope of the jungle, that has almost disappeared and has botanic species such as bromeliads, surrounds the city of Rio and has been chosen by UNESCO a World Heritage Site. This route around the museum also aims to provide an educational ecology concept. With that same spirit, the roof wings are equipped with mobile photovoltaic panels for the building’s energy supply. 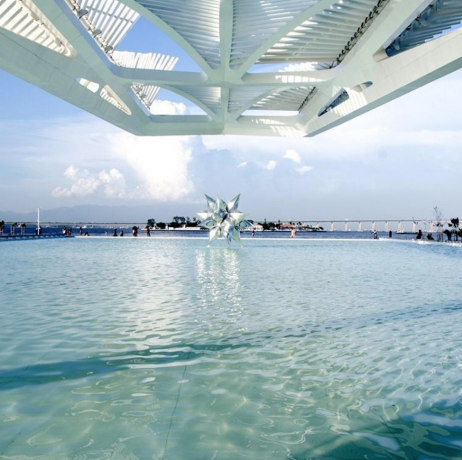 Thanks to this outside route of the building, visitors can learn more about eco-friendly and environmental elements, at the same time that they enjoy the sight and the beauty of the building and the surrounding Guanabara Bay from the viewpoint. Museeum got back to Alexandre Fernandes to talk about the historical context of the museum location. Is the location of the museum particular, symbolic? 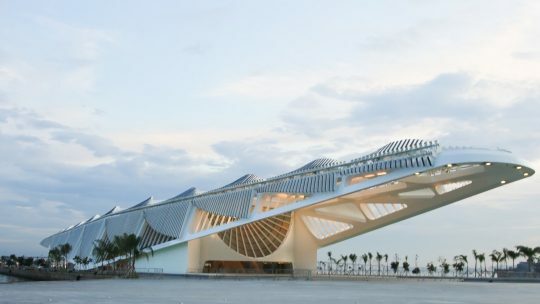 The elongated building, “floating” over the pier, as architect Santiago Calatrava put it, was designed to respect the surrounding historical landscape and the visibility of its neighbors: the Baroque São Bento Monastery; the A Noite building, the first skyscraper in Latin America and headquarters of Radio Nacional; and the Museum of Art of Rio (MAR). Other important historical sites nearby include the Pedra do Sal and the port, arrival point for the largest number of slaves in the world; the Gamboa neighborhood, one of places where samba originated; and the historic Conceição Fort. 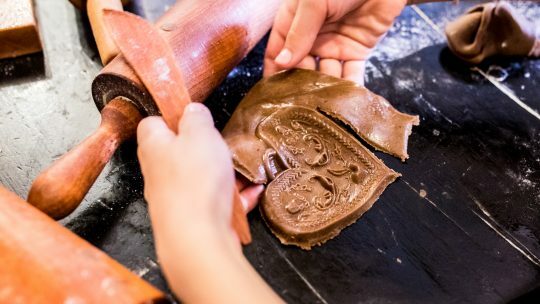 Excavation for the Porto Maravilha project uncovered the site of Valongo Wharf, an international slave trade hub where about one million African slaves arrived. The Portuguese population rose slowly in the region around the bay, but the population made up of black slaves brought from Africa increased ever more dramatically. 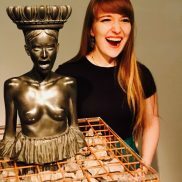 The figures for Rio de Janeiro show that, between the 17th and 19th centuries, residents of African origin far surpassed those of European origin. When several laws culminating in the abolition of slavery in 1888 and encouraging immigration caused a veritable population explosion in Brazilian cities. In the case of Rio de Janeiro, its population rose from close to 50,000 at the end of the 18th century to nearly 1 million at the start of the 20th century. This process further intensified in the 1930s, with the start of industrialization, and grew even stronger in the 1950s. Cities, especially the largest ones, found themselves occupied by immense pockets of poverty. 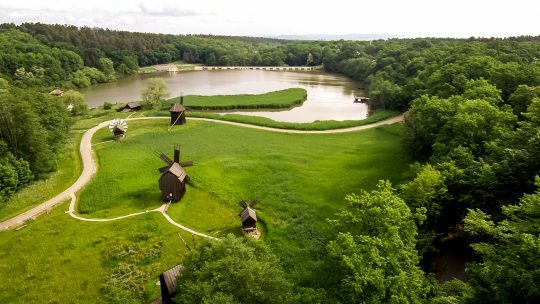 The new inhabitants, in the absence of alternatives, occupied areas considered risky and/or unhealthy, such as unstable slopes, the banks of rivers and flood plains. Over the course of 500 years we have seen a slow but continuous process of land use and occupation, as if natural resources were infinite and all that abundance were eternal. Whole forests have been almost completely wiped out, water systems have been altered, mangroves and shorelines have been drained and extended, rivers have been canalized, and waste has been discharged into water bodies (such as lakes, lagoons and beaches). The current bay is very different to that one of clear waters, shaped and adorned with little coves, beaches and mangroves, set against a backdrop of dense tropical forest: a vision of blissful paradise for the Portuguese navigators who saw it for the first time. 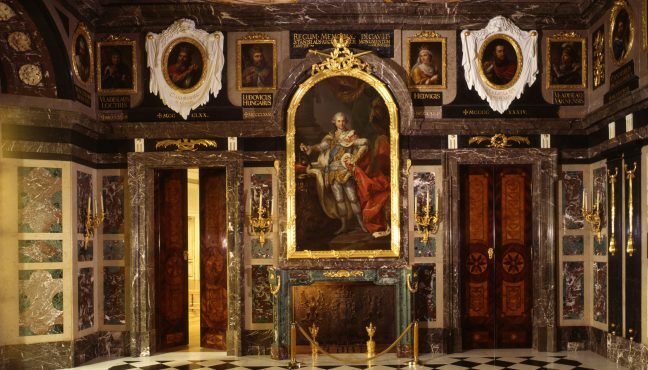 They were travelers who, following the orders of King Manuel I, the Fortunate, had undertaken a mission to explore the Brazilian coast nearly two years after the land’s discovery. When they entered the bay, flanked by splendid granite mountains, they believed they were at the mouth of a great river. As it was January 1, they named the area “Rio de Janeiro” (“River of January”). 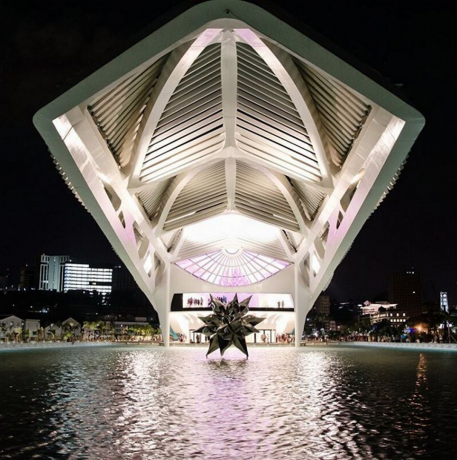 The possibility of locating Museum of Tomorrow in this area, surrounded by the Guanabara Bay offers us a huge opportunity not only to tell the story of how this city was raised but also of our responsibility to preserve and re-think the way men interferes with the surrounding environment. 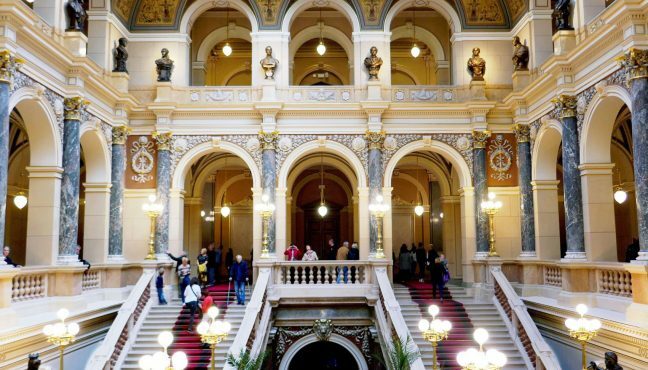 Museu do Amanhã, situated in a historically – significant space, is breathtaking from the outside and thought provoking on the inside. The museum is put together so eloquently, that even if you have just half an hour to spend there (although we would recommend dedicating at least two hours), the questions the museum raises will stay with you for a long time. You will inevitably think of how each of us is devastating the planet and what legacy we are leaving behind. 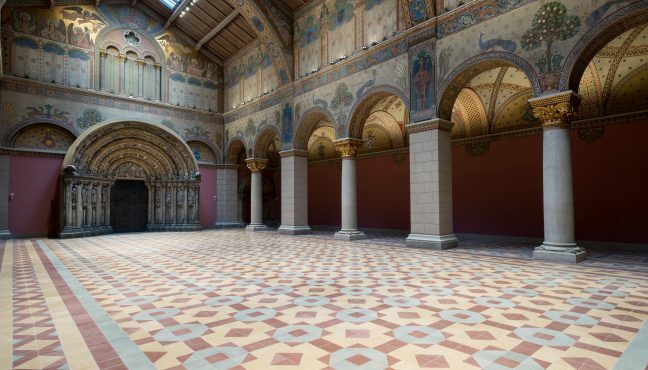 But its not all sad and gloomy – Museu do Amanhã also shows what is being done to recover the damaged areas and inspires to think of what more can be done. 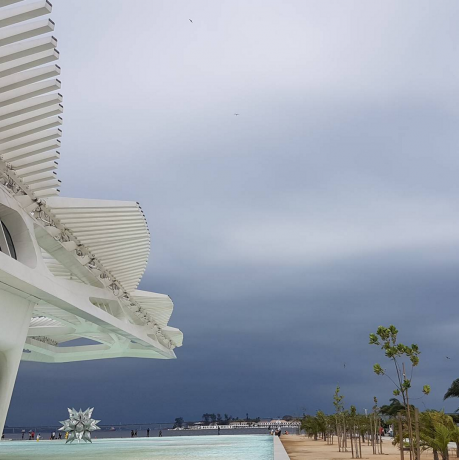 Museum of Tomorrow is a perfect combination of dramatic architecture and profound, heartfelt collection, culminating in beautiful views of the historical Rio de Janeiro Bay.